Show spectators seeing the Royal Show Champion 'Saintjuliots Bewitched' in the ring this year would find it hard to believe she was the same youngster bought some years ago in a severely neglected, sorrowful state. 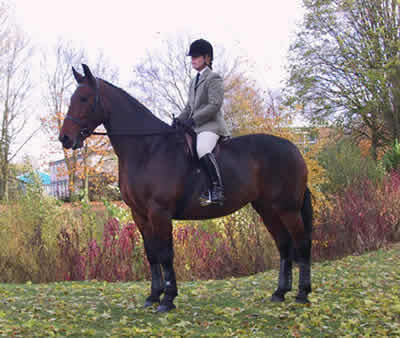 The impressive seven year old Bewitched, a pure bred Cleveland Bay mare, who now stands at 17.2 hands high, is owned by Joanne Firth of Thornhill, near Dewsbury and has been representing the York-based Cleveland Bay Horse Society in ridden demonstrations at equine events around the country. 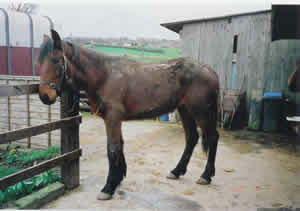 Joanne first saw Bewitched as a yearling down in Cornwall, and immediately fell in love with her, paid the deposit and waited for the papers to arrive. However, when they went to collect the horse six months later, Joanne was in for a shock.
" I was heartbroken, and hardly recognised her as the same yearling we had seen six months earlier - she was in the corner of a filthy stable with no drinking water to be seen, and appeared to be just skin and bone," said Joanne. "Her eyes were dull and lifeless and she had rainscald on her neck and back, as well as mudfever and a nasty cough. "I really wasn't sure what to do as I didn't want to leave her, but she was hardly the show horse I had dreamt about!" But Joanne decided to take the risk, and after a struggle to get the weak and trembling horse loaded into a trailer, Bewitched was transported to her new life in Yorkshire. Initially, the horse was so thin and weak that the vet refused to vaccinate her, and so over the next few weeks Joanne began a careful and thorough regime of worming, feeding five times a day, grooming and training, along with lots of TLC. Eventually, after months of dedicated hard work, Joanne decided it was time for Bewitched to make her debut in the show ring, and was repaid for all her efforts with a remarkable 3rd placing at the 1998 Royal Show, and later scooped the national prize at Malvern. From then onwards, Bewitched was unstoppable, and as a three year old took first place and champion at the Royal Show, the Great Yorkshire Show, Ryedale, and Harewood, becoming overall in-hand champion. The successes continued after Bewitched was broken in to ride, and then in 2002, she was put in foal to High Park Schoffield, son of the famous Storthouse Temptation, who won the CBHS King George V Cup four times in the 1980's. Unfortunately this brought more sorrow for Joanne as Bewitched gave birth to a colt foal which was sadly lost to colic when only one week old, and help was sought from the National Foaling Bank for the grieving mare. But this story has a happy ending, and after yet more show triumphs this season, Joanne and Bewitched are looking forward to the future, with training for showjumping, cross country and dressage proposed for this winter, and plans for another foal being put in place for 2004. Said Joanne: " I am thrilled with the success that Bewitched and I have had together, and I hope it will encourage more people to consider a Cleveland Bay when searching for their ideal horse."